Passengers waited for more information inside Logan Airport early Wednesday after the emergency landing. An Iberia Airways flight en route to Madrid made an emergency landing overnight at Logan Airport after suffering an engine-related issue mid-flight. The plane landed without incident and there were no injuries, according to a Madrid-based spokeswoman for the airline. The flight, which had 265 passengers, originated Tuesday around 9:15 p.m. at New York’s John F. Kennedy International Airport. Crew members noticed an engine-related issue about 90 minutes into the flight, the spokeswoman said. That was after the flight passed over Boston. The pilot declared an emergency and the flight was diverted to Boston, according to FAA spokesman Gregory Martin. The flight landed without incident, according to the FAA and the airline. Felipe Serantes of Madrid said he was on the flight. About two hours into the flight smoke became visible the cabin, Serantes said in a conversation through Twitter. “Flight attendants were worried” more than he’d ever seen, Serantes said. Melissa Miller from New York also said she was on the flight. Passengers “knew something was up” when a smoke- and gaslike odor filled the cabin, Miller said. The crew did not mention the issue until “a bit later,” Miller wrote in a Twitter direct message early Wednesday. Most passengers remained calm, Miller said. Passengers were being bused from Boston back to New York, the spokeswoman said. More flights out of JFK will make it easier to rebook passengers, she said. 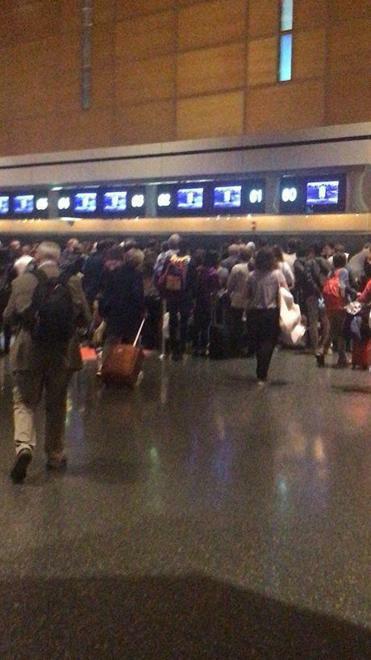 Passengers described a chaotic scene inside the terminal at Logan after the emergency landing. Miller said airline officials made no announcements, other than about busing passengers back to New York. Massport officials did not respond to requests for comment early Wednesday.